Most home loan borrowers face the dilemma of whether to use their monthly savings to prepay their loan or set it aside for emergencies. In most cases, the extra money just sits in their savings accounts earning below par (and taxable) interest. A home saver loan lets you have the cake and eat it too. You will be able to park this amount in the home loan account for any number of days and pull it out anytime for your urgent needs or regular expenses when they become due (e.g., paying kids school fees every quarter). The money thus kept in the home loan account reduces the total interest outgo on your home loan and helps you close your loan faster. MaxGain is a popular home saver loan product from SBI. Similar home saver loans, albeit with different interest rates, are also available from other banks including Citibank (Home Credit), Standard Chartered Bank (HomeSaver), HSBC (Smart Home) and IDBI Bank (Home Loan Interest Saver). We will focus exclusively on SBI MaxGain in this article. Other home saver loans listed above are quite similar and may differ in minor details. Before we delve deeper into SBI MaxGain, let’s understand what is an overdraft (OD) account. An overdraft facility is a credit line provided to individuals against their assets. You can think of it as being similar to a credit card with a limit but without the interest-free (grace) period. i.e., the interest clock starts ticking as soon as the amount is withdrawn instead of waiting until the payment due date. The interest rate on overdraft account is typically lower than credit card. You can withdraw money upto the sanctioned limit and will have to repay the outstanding balance along with interest only for the duration that you utilize the money from the account. How is SBI MaxGain different from regular home loans? SBI MaxGain is a home loan that is sanctioned as an OD with a limit that is equal to the approved loan amount. Your home acts as the underlying security for the OD account. This product has the same interest rate as the other home loans from SBI upto Rs. 1 crore (as of this writing). A premium of 0.25% is applied for home loans above Rs. 1 crore. There is no extra charge for use of OD facility. The current account (OD) comes with cheque book and net banking facility. whose earnings aren’t constant – self-employed or businessmen. At a recent real estate expo, SBI told me that MaxGain isn’t available for the self-employed and businessmen. who have a periodic (quarterly, semi-annual or annual) bonus or variable pay component that can be parked in the OD account. who have savings after paying EMI and other monthly expenses. NRIs and professionals with higher income. Upon final disbursal, your Limit and Drawing Power will equal the sanctioned loan amount. These amounts will reduce with each EMI payment. Drawing Power = Outstanding principal loan amount. Available Balance = Any surplus amount parked in this account + accrued interest savings. More on this below (Point 5 thru 8). Book Balance = Drawing Power – Available Balance. This is shown as a negative (minus) amount. Your monthly EMI will not vary despite surplus amount in the OD account. Principal portion of the EMI is applied on the date of EMI payment and goes to reduce the Drawing Power and the Limit. The principal portion of the EMI is calculated as per the original amortization schedule. Surplus amount deposited in the OD account and accrued interest savings do not alter the principal portion of the EMI. Interest portion is calculated against the Book Balance on a daily basis and is debited at the end of the month. All surplus money parked in the home loan account goes towards Available Balance. Even if the surplus amount is kept only for a few days during the month, it helps reduce the interest component of the EMI for that month. Since the interest is calculated on the Book Balance instead of outstanding principal, any excess amount (i.e., EMI – Principal – Interest) is added to the Available Balance. Although the borrower has withdrawn all the surplus money that he deposited at the end of month-24, he still has interest savings (Available Balance) of 19,529.72. You cannot achieve such results using the regular home loan. EMI includes two components: Principal and Interest. The principal component increases and the interest component decreases with each successive payment. EMI remains constant throughout the loan tenure. Same as regular home loan. Principal and Interest components are calculated as per the original amortization table. Principal component is calculated as per the original amortization table. The Drawing Power is reduced by the principal amount of the EMI each month. Interest component, however, varies depending on Book Balance. 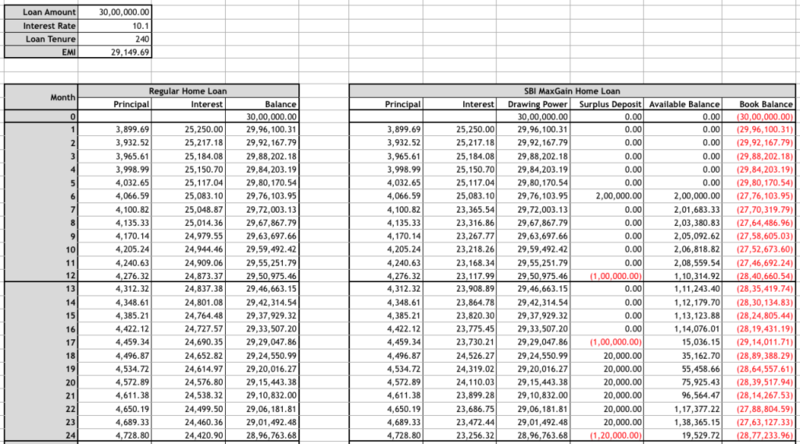 Interest is calculated on the outstanding principal loan amount (as in the original amortization table). Interest is calculated on the Book Balance on a daily basis and is debited at the end of the month. Excess amount from the monthly payment (i.e., EMI – Principal – Interest), if any, is applied towards the Available Balance. Principal and Interest components are applied on the EMI payment date itself. Principal is applied on the EMI payment date itself whereas Interest is debited at the end of the month. Until then, the entire interest portion is shown as part of the Available Balance. Cannot be used like SB or current account for outgoing transactions and bill payments. You can use the home loan account to do funds transfer (NEFT, RTGS etc.) and bill payments using cheque book and net banking facility. Available Balance is the limit for such transactions. Home loan is closed when the outstanding principal amount is zero. You can approach the bank to close your home loan when the Book Balance reaches zero. Increases your Available Balance and reduces your Book Balance. Your amortisation schedule changes. You can opt to reduce either your loan tenure or loan EMI. 1) If you opted for lesser loan tenure, then more of your future EMI goes towards Principal. 2) If you opted for lesser EMI, your future EMI (and consequently your principal and interest portions) will reduce. Your amortisation schedule remains unchanged. However, more of your interest portion goes towards Available Balance. The money is gone forever. You cannot undo this action. You can withdraw the surplus amount at any time. Your amortisation schedule remains unchanged. Now, less of your interest portion goes towards Available Balance. Tax deductible under Section 80C. Interest savings are not tax deductible. If you make partial prepayment on your home loan, that money goes to reduce the outstanding principal and is not available to you anymore. However, any surplus funds parked in MaxGain home loan account can be withdrawn anytime. However, surplus fund deposited before full disbursal or for under construction property cannot be withdrawn until complete disbursal. Your interest outgo will reduce because of this deposit and interest saved will get added to available balance, but you cannot withdraw till you get possession. If surplus funds are parked in the OD account, it saves interest outgo on the home loan. Helps you close the loan faster. Interest saved is interest earned . Experts recommend this product over other investment products including tax free bonds and FD. Instead of opening a Fixed Deposit (FD) for 1-5 years, if you park the same funds in the OD account, you will get 1 to 3% higher savings. Note that you will be realizing this rate even if you park your funds temporarily unlike FD where you will pay a penalty for premature withdrawal. On top of that the savings with MaxGain are tax free. Any amount that you deposit to Maxgain will not be treated as “pre-payment” under Section 80C. Hence, that amount does not qualify for Section 80C rebate. Experts advice that you should only park amount over and above the tax deductible interest portion. Interest saved (as shown under Available Balance) is not tax deductible under Section 24.